What would the world be like if it were more gender-balanced? How would it change our schools, homes, our communities and even our planet? From opportunity to access to equal pay, and much more, 50/50 Day is committed to helping everyday people become champions and active participants in the changes our world so desperately needs. Screen the acclaimed 20-minute film 50/50 (view it here) or watch the new two-minute film What If (which will be premiering on 50/50 Day). 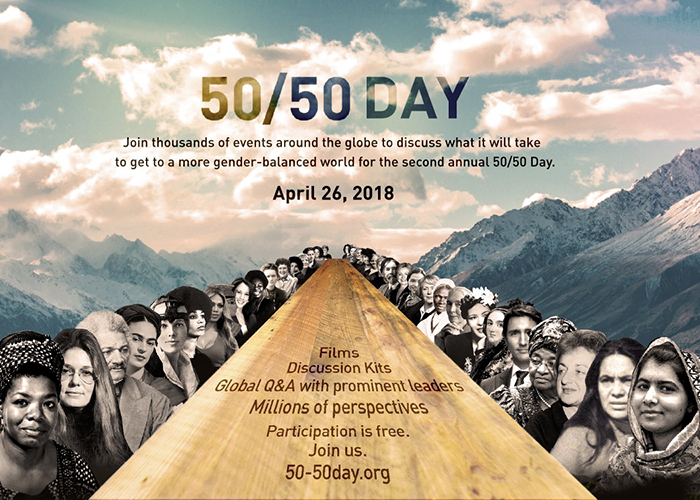 Tap into a live online Q&A that unifies all the film screenings and features prominent leaders with diverse perspectives discussing how to get to a more gender-balanced world in all sectors of society: business, politics, culture and home. View last year’s lineup here. Take a look at our printed discussion materials to help you dive deeper into the conversation. The 50/50 Day team will be releasing pledges for individuals, companies and schools so everyone can start taking action #Gettingto5050. Visit 50-50day.org to learn more about this global movement and to sign up your school!